The Center’s Speaker Bureau offers presentations to community groups at the Center or your location. Each 45-minute lecture includes a slide show and a question and answer period. Learn about the history under your feet and the recent research conducted at the Center. San Diego is blessed with abundant natural and cultural resources. Over 23,000 archaeological sites have been discovered in San Diego County. These sites contain the material culture of people who have lived in the region for over 10,000 years. This presentation will discuss the changes in artifacts and lifestyles of the ancient people who called San Diego home. Archaeology is a wonderful tool for understanding the past and bringing context to the present. Please join us for a presentation on 10,000 years of San Diego history and a new understanding of the past. For 99% of human history, we lived as hunter-gatherers. For more than two million years, all humans lived in small-scale societies, moving frequently and relying on wild food resources. It was not until about 12,000 years ago (less than 1% of human history) that plants and animals were domesticated in some parts of the world, allowing a more settled lifestyle based on farming and greater population densities. Fundamentally, our biological and cultural make-up remains rooted in this shared hunting and gathering lifestyle. This presentation explores the hunter-gatherers who lived in the San Diego Region for over 10,000 years in the context of world history. Archaeology is more than just digging stuff up. Understanding what occurred at a site requires the application of several sciences, even that math that you said you would never use. Archaeology is a branch of Anthropology, the study of human culture. Archaeology focuses on artifacts and sites to learn how people lived in the past. Archaeology reinforces the concept of a shared human heritage and provides modern people with perspectives on their own place and time in history. 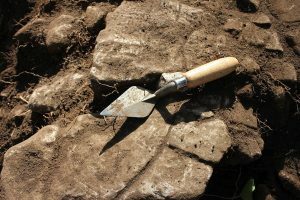 Archaeology has been going on in San Diego since the early 1900s. People who lived in the past weren’t “primitive” or less smart than we are today; they simply made tools using the materials and technology that were available to them at the time. This presentation discusses the scientific principles and techniques archaeologists use to learn more about ancient cultures. For questions regarding the Center’s Educations Programs, or to sign up for classes, please contact Executive Director, Cindy Stankowski at cstankowski@sandiegoarchaeology.org.